Melaque hotels and accommodations are plentiful, ranging from small two-room accommodations with a shared kitchen to sprawling private homes complete with staff. Looking for a simple campsite or a deluxe vacation rental? All can be had. Do you desire a hotel on the beach? Do you need to be close to town or do you want a private quiet escape? Melaque accommodations and places to stay range from small two-room suites with a shared kitchen to sprawling private homes complete with staff. How to choose your vacation accommodation in Melaque depends on your personal style. At El Palmar Beach & Tennis Resort, located across the street from the beautiful Melaque beach and just steps away from restaurants and small Mexican run tiendas or grocery stores, you'll find all the comforts you need to enjoy your Mexico vacation. Our boutique Melaque hotel offers one-bedroom and two-bedroom accommodations all with full kitchens, comfy beds, large bathrooms, daily maid service and WIFI. Each one of our Melaque hotel suites features traditional Mexican design accents while maintaining the unique comfort and cleanliness you expect from a first-class hotel. Unlike other Melaque accommodations we feature a pool, BBQ area and lots of private space. We are a NON SMOKING RESORT. In consideration of our nonsmoking guests and in compliance with the new Jalisco nonsmoking regulations. NEW - 4 Luxury One & Two Bedroom Penthouse Condos! 50% Deposit required to reserve your accommodations. Balance is required to be paid 60 days before arrival. The local Banamex (bank) has ATM machines. 60 days prior to reservation, full refund. Less than 60 days, refund based on rebookings. Guests will be financially responsible for the dates they have booked. Trip insurance should possibly be considered. This is an example of a policy one of our guests use. https://www.bcaa.com/insurance/travel/trip-cancellation-insurance. Book your vacation for 2 weeks (14 days) and receive 10% off of the regular rate. Book your vacation for 3 weeks (21 days) and receive 15% off of the regular rate. 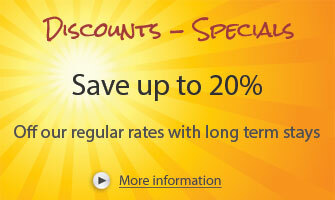 Book your vacation for a month (30 days) and receive 20% off of the regular rate. The El Palmar beach resort offers very traditional Mexican décor and motifs, including beautiful tile work that is so famous for its rich colors and happy designs. For thousands of years, artisans in Mexico have made ceramic tiles by hand and painted them with unique designs handed down in families for generations. Ceramic tiles and hand painted sinks make every room more interesting and add that splash of color for your day. They can be found on many surfaces around the resort, as well as creating interesting wall murals for your enjoyment. The furniture is also covered with rich colorful fabrics, to add to the uplifting and happy atmosphere at our boutique resort in Melaque. Mexican textiles have a vitality that is unsurpassed elsewhere in the Americas. The arts of spinning, dying, weaving and embroidery are practiced in hundreds of rural communities where indigenous people retain distinctive clothing styles. Women with years of experience and centuries of tradition behind them create the colorful, handmade woven textiles. Their sense of design and color is dazzling and in many cases native traditions, such as Mayan or Mixtec, are coupled with post-Colonial influences to great effect. El Palmar resort also has wall hangings done by local Mexican artists; possibly hand-woven wool tapestries or hand-woven Oaxaco rugs using natural dyes. Mexican blankets are another artistic and colorful textile made with many designs, often made of wool. They are also called “Wool Mexican Serape Blankets”, worn as a covering for people, used anywhere as a blanket or decorative cover. Mexico is a fabulous source of hand-crafted woven and embroidered textiles, with bright woven blankets, intricate pillow covers and graphic rugs to brighten any room. You may find that you want to take some Mexican textiles, tiles, dishes or art works home after your stay at El Palmar. The town shopping is within easy reach as you can walk from one end of town to the other. To list just a few vacation activities: golf, tennis, hiking, biking, horseback riding, sight-seeing, whale watching, bird-watching, beach lounging, swimming, surfing, scuba diving, snorkeling, fishing and turtle viewing. So along with great accommodations; you have good beaches, many choices of activities, amenities and great nightlife too.